Can your employees recall their Agency Interest (AI) number? Can they locate the store’s compliance & training records? Are all employees trained for an emergency? Is your store compliant with C-operator/UST Facility Employee training requirements? Will employees remember their training? Don’t take a chance. Everything your staff needs to know in one quick, easy reference. KPMA’s Safety Poster reinforces employee training and puts essential information in front of your staff in case of an emergency. 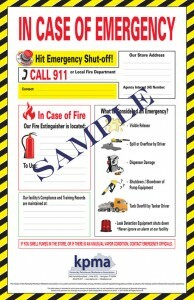 Customize with your store’s unique emergency contact information. Be safe. Be prepared.